Over the last month Hayli and I have been inviting the students from our leader team over to our apartment for dinner! It has been so encouraging to hear how God has brought each one of these students to UT Arlington and how God has used Christian community to inspire them to want to make disciples of Jesus on their college campus. Thank you for your investment in them! Pictured above are Ashlyn, Esther, Jeff, and Cole. Please be praying for them along with the rest of our leader team, for their ministry to their peers, and for their continued maturity in Christ. We are so grateful that you have provided for us the opportunity to welcome young students in our home and provide them with a home cooked meal to enjoy. Our hope in doing this is to bless them and encourage them in their faith just as disciples of Jesus have been doing for one another for thousands of years. This is a picture of some of the rest of our male leader team. Every month my cominister Jalen Quintana and I get to welcome these guys over for a time of sharing of good news. And we also eat a meal together in fellowship. These are the young men who week in and week out lead small groups, and study the bible one on one with their peers. Each one of these young men are dedicated to making Jesus known on their campus. I have no reason to doubt that these young men will be future leaders in their churches and in their career fields, and I'm so grateful for the opportunity to mentor each one of them, to teach and encourage them in their pursuit of Jesus as Lord of their life. And lastly, this past weekend was fall camp. 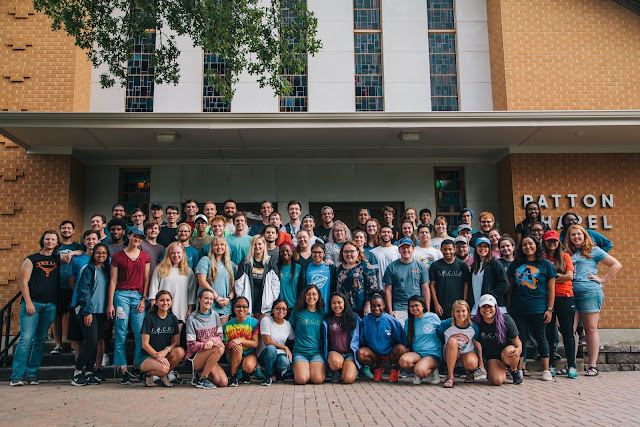 We had about 80 students come to a retreat where they worshiped God together, shared with one another testimonies of how God has changed their lives, and together listened to the life and teachings of Jesus and reflected and shared together what aspect of Christ was most appealing to them or spoke to their heart the most. One particular thing from this weekend is that a number of the young men who attended were not Christian, and one of them earlier today asked if we could get together for lunch. When we met he told me he was wanting to follow Jesus! He had read the gospel of Mark for the first time in his life the week prior to fall camp and had found Jesus inspiring then, and then after fall camp he went home and started to read John. God is certainly maturing disciples on the college campus, but praise God that he is also adding new sheep to his fold! What a good good father we have. It has only been one day since fall camp, so the fruit of the weekend has still probably yet to fully be recognized but I am so grateful for your support of this ministry. God is using your gifts and responding to your prayers as he raises up a new generation of disciples who will speak and sing the praises of our Lord to all who will listen. As always below is the monthly student testimony so be sure to check that out. Thank you for all the ways that you give to and support college ministry. God's kingdom is really breaking through here at UT Arlington and I thank God for your role in that. In Christ, Austin. Woah! I love that pic from fall camp! Also, that's so cool about that guy who wants to become a disciple. Praise God! You're doing good work brother!